I been out practicing with my camera. There will be a total lunar eclipse on Sunday night (January 20th), around midnight on the eastern seaboard. The next total lunar eclipse in our region will not take place until May of 2021. What make it so special is that the lunar eclipse will take place with the moon being at its closest to the Earth (making it a SuperMoon), and it is in January (making it a Wolf Moon). During the lunar eclipse, you will see a reddish tint being refracted by the Earth’s atmosphere (making it a Blood Moon). Pretty cool and awesome! I want to try something different this time and try to take pictures in sequence. The main reasons for taking pictures on Tuesday night was to playing around with my camera the setting. 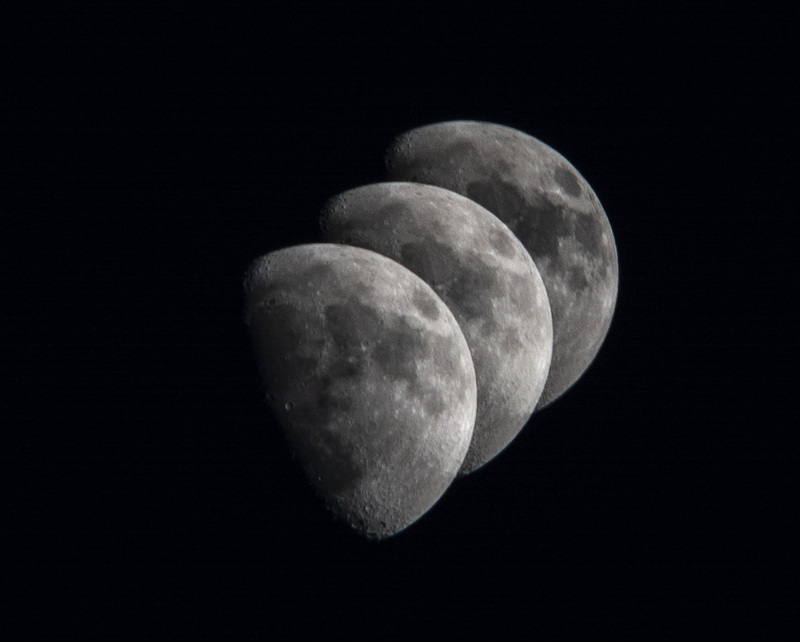 The Moon was in the 1st quarter and at 68% tend upward (or rising). I used my Nikon D7100 camera with the Nikon Nikkon DX AF-S 55-300mm 4.5-5.6 GED len with a tripod. Aperture: f/11; and an ISO: 100. The following is good article about the event and tips on how to take Moon shoot, Super Wolf Blood Moon Eclipse on January 20. I found out that my Nikon D7100 will only let me take 3 pictures in sequence at 30 seconds apart. The picture I posted was with 30 seconds sequence. But after testing in house, I found that I might be able to push the interval to 40 seconds. I will try to take multi-sequence at 30 seconds and 40 seconds apart. I can use Photoshop to cut and paste them into one picture, but that is not same.